The Arts Mentorship Program and partner SB Dance Arts run four Student Dance Companies. Together, our Companies provide a pre-professional experience for serious dancers ages 9-18 years old. 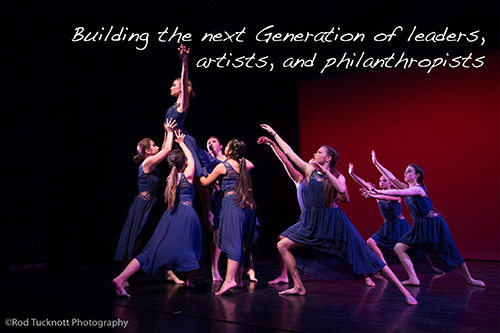 Company is the cornerstone of our program and a place where young dancers grow up on stage. Many students remain in the program through graduation, and this helps them develop a community and a place where they belong. Many of our Company Alumni are working in the industry and are leaders inside of their fields, plus colleges and future employers always love to see a child who is committed and grows inside of their passions. Most importantly…THE DANCERS LOVE IT! Company provides the opportunity to perform, travel/train with the top dance professionals in the country, and make lasting friendships. We would for love for your dancer be a part of this 17-year tradition that leads dancers on a path of positivity and success. Students participate in an extensive audition in September in hopes of receiving a coveted spot in Axis, Impulse, Vibe, Impact, or the Emerge Pre Company. Company dancers train in ballet and jazz technique and have extensive performance opportunities. They are also mentored in choreography, production, lighting, and have opportunities to attend Master Classes, travel to conventions, while having many opportunities to attain valuable leadership skills. Through AMP’s partnership with Santa Barbara Dance Arts, company dancers receive their formal dance training through a broad and rigorous curriculum offered by Dance Arts faculty. Company members are also trained in mentorship and philanthropy. Dancers can serve as dance company captains, big sisters to younger dancers, and teaching assistants. Company dancers also learn about the business of running and sustaining dance programs at a local level. Our partnerships allows us to provide financial assistance to help make this program accessible for all regardless of financial need.